We have a big new shipment of organic cotton from Cloud 9. First up we are sharing these soft organic flannel prints. Perfect for baby sewing! Next are these soft stretchy organic cotton jerseys, perfect for t-shirts, tops, and dresses for kids or adults. We also have loads of new organic cotton broadcloth prints! Look for those in an upcoming blog post, or stop by the store! We have a huge new shipment of utterly gorgeous silk taffeta! This crisp, fine fabric has a glorious luster, deeply saturated colors, and a firm, smooth hand. Many of these taffetas are made with a shot weave, in which the warp and weft are two different colors, giving an iridescent effect. Taffeta is a crisp fabric with body, making it suited to garments that need to hold their shape and create volume. No droopy ruffles or sad, floppy skirts here! Taffeta will make bows that stand on their own and dresses that fit and flare, while feeling almost weightless. There are a lot more colors in our store! Stop by and feel this dreamy fabric for yourself! White on white is classic, cool, and fresh for spring and summer. Take a look at a few of our selection of white on white fabrics, from openwork eyelet to subtle embroideries to the sheerest Swiss dot. We photographed all of these fabrics over a light blue background so you could appreciate the pattern and texture. Our Spring Sale goes all weekend, with EVERY fabric in the store on sale! Stop by for great discounts on fabulous fabrics. 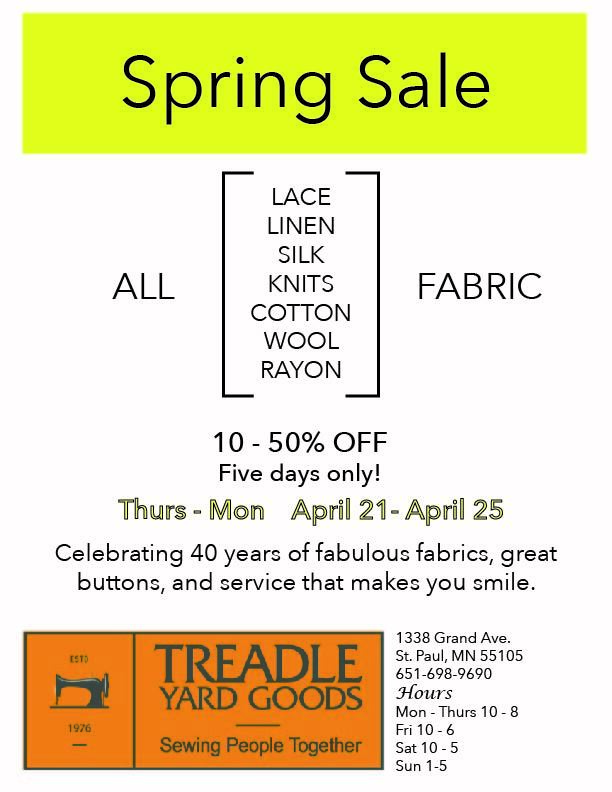 Treadle is celebrating spring with a sale! Spring and Summer Sewing Classes! Our new Spring and Summer Class Schedule is now available! Sign up and come in for a wonderful experience in our dedicated classroom space staffed by knowledgeable instructors. Learn a new skill, create fantastic garments, and just plain have fun! From beginning "where do I start?" classes to advanced fitting techniques, sewing with knits, and quilting, there is something for everyone! There are single-evening classes, multi-week classes, and a few interesting lectures as well. Plus, tons of summer sewing opportunities for KIDS! 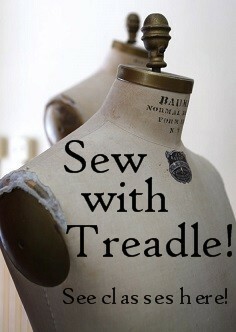 You can view the complete schedule at www.treadleyardgoods.com/classes. Space is limited so sign up early to guarantee your spot! You can sign up in person at the store OR by phone at (651) 698-9690. Making spring blouses and shirts? We have you covered, from soft cotton lawn to crisp, classic shirting. Here are a few highlights from our new arrivals! New fabrics arrive almost daily! Come and see what's new. More Spring goodness: crisp, colorful linen! Linen is a spring and summer staple. Always classic, never out of style, linen garments can take you from casual to dressy with ease. We currently have a great selection bursting with bright colors and soft neutrals. These soft new plaid cottons are just right for spring sewing! Perfect for everything from soft shirts and blouses to flowy skirts and picnic dresses. 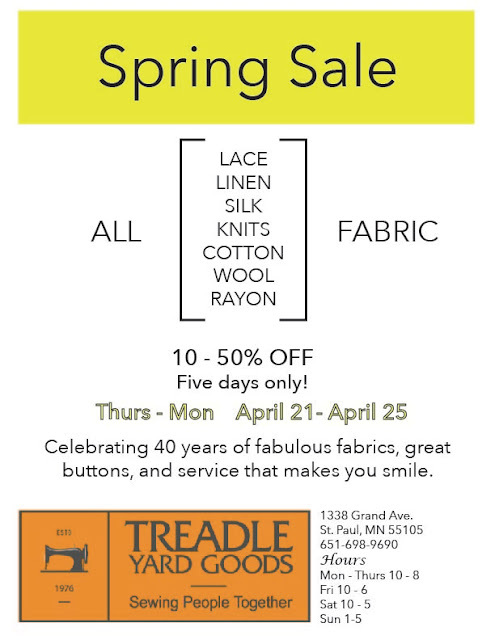 Spring has sprung at Treadle! Come in and see all of our wonderful seasonal fabric choices!